Although human health impacts are of prime importance, another societal concern is the massive mortalities of wild animals that are caused by HABs. Animal mortality events, such as fish kills, bird kills, or strandings of manatees and whales, have enormous impacts on local communities. These mortality events also affect freshwater and marine aquaculture industries. In the ocean, large numbers of salmon and other farmed fish can be killed in just a few hours, succumbing either to toxic algae or to species that kill in other ways. As algal toxins accumulate in the food web, turtles, dolphins, manatees, and other marine mammals can be affected. As techniques for detecting algal toxins in animal tissues have advanced, so has our appreciation of the number of marine mammal deaths linked to HABs. In fact, more than 50% of the unusual marine mortality events are now associated with HABs. 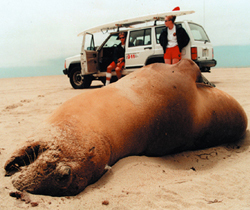 Sea lion mortalities are now almost annual events along the southern California coastline and many of these have been conclusively linked to the ASP toxin passed through the food web. The recent deaths of 19 humpback whales near Georges Bank in the Gulf of Maine is another such event associated with domoic acid poisoning. In freshwater systems, the impacts extend to birds and possibly alligators and other animals. Toxins associated with cyanobacteria, the major harmful algal group in freshwater environments, have been implicated as the cause of mass mortalities of fish and birds and have also been tied to the death of pets and livestock that may be exposed through drinking contaminated water or licking themselves after bodily exposure. For this reason, dog deaths have emerged as an unfortunate early warning that a toxic cyanobacterial bloom is occurring.